Frustrated potential witnesses who have been unable to speak with the F.B.I agents conducting the investigation into sexual-assault allegations against Donald Trump’s Supreme Court nominee, Brett Kavanaugh, have been resorting to sending statements, unsolicited, to the Bureau and to senators, in hopes that they would be seen before the inquiry concluded. On Monday, President Trump said that the Bureau should be able to interview “anybody they want within reason,” but the extent of the constraints placed on the investigating agents by the White House remained unclear. Late Wednesday night, Senate Majority Leader Mitch McConnell announced that the F.B.I. 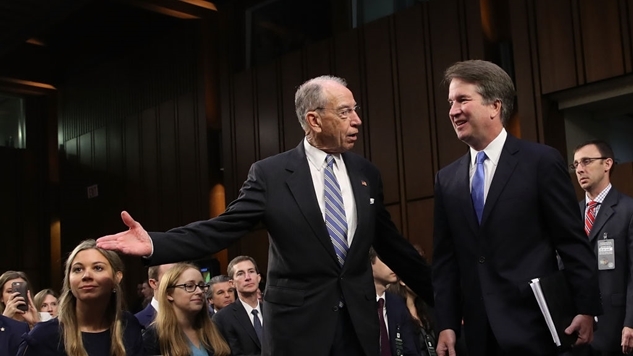 probe was over and cleared the way for an important procedural vote on Kavanaugh’s nomination to take place on Friday. NBC News reported that dozens of people who said that they had information about Kavanaugh had contacted F.B.I. field offices, but agents had not been permitted to talk to many of them. Several people interested in speaking to the F.B.I. expressed exasperation in interviews with The New Yorker at what they perceived to be a lack of interest in their accounts. The FBI even lacks White House approval to interview the two central players in this investigation: Dr. Christine Blasey Ford and Brett Kavanaugh. So if they’re not interviewing the two people at the center of this incident and they’re not talking to anyone who may be able to corroborate anything in these claims other than Kavanaugh’s friend, Mark Judge, what the hell is the FBI investigating? Mitch McConnell has already scheduled a vote for Kavanaugh on Friday, and you should expect every single Republican (except Lisa Murkowski, she has some local pressures that may push her to vote no) to put a credibly accused sexual assaulter on the Supreme Court (for the 2nd time), because the lesson of every single political battle of our era is that there is no functional difference between the Republican Party and Donald Trump. They are one and the same.